In my continuing effort to scrounge up interesting meals from my increasingly barren kitchen, I remembered some boneless chicken breasts in the freezer and decided to cook them up with a balsamic glaze. 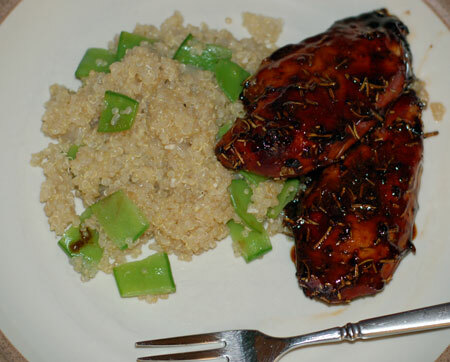 The marinade was very quick to throw together, and reduced down to a dark, sticky syrup while the chicken baked and a pot of accompanying quinoa perked on the stove-top. I changed the recipe very little (left out the sesame seed garnish), so I won’t reproduce it here. If I make it again, though, I may well strain out the rosemary before reducing, because it seemed quite strong, at least to my palate. My chicken came out a bit on the dry side with the recommended cooking time, though the finishing glazed helped tremendously with moisture, flavor, and color. For a vegetable contrast, I chopped some snow peas and steam-sauteed them in a little skillet before tossing them through the quinoa, and was very pleased with the result. Not a bad little weeknight meal, but not particularly memorable. At least it was something new for the blog, though! Source: Giada de Laurentiis, via Confections of a Foodie Bride.